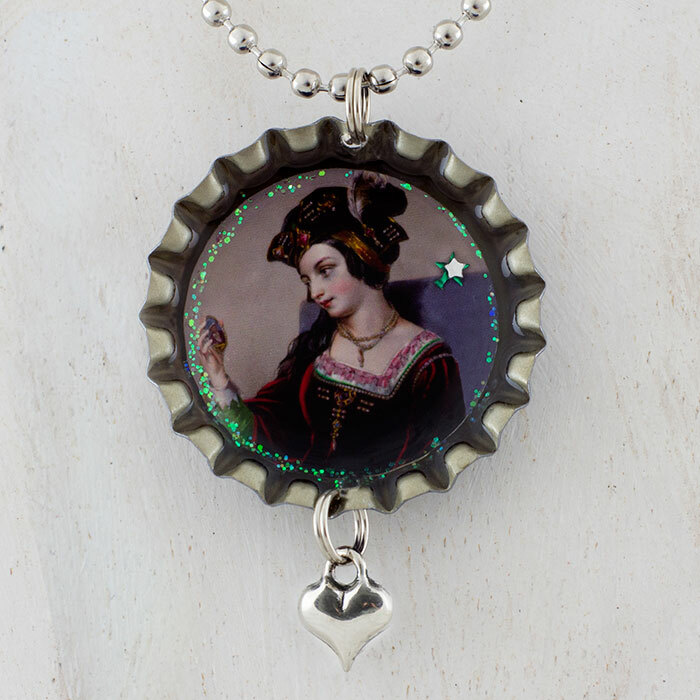 This beautiful, unique and collectible bottle cap necklace features a lovely hand colored etching of Anne Boleyn gazing at Henry in her pocket mirror. The miniature photograph is protected by a durable, archival and flawless resin that safeguards the image from water damage and fading. Rendering the charms completely waterproof. The back of the bottle cap is waterproof and specially printed with a Tudor Rose. The inside of the bottle caps are decorated with gems and glitter. Dimensions: Bottle caps are 1 and 3/16 inch diameter. Made from unused vintage caps with the edges still flared so that they are not sharp.